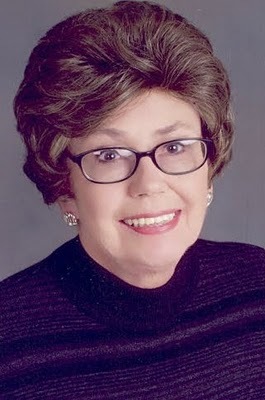 On January 1, 2011, Louise Reiss, a physician best known for having directed a project called the Baby Tooth Survey, died in her Florida home at the age of 90. Reiss, a New Yorker born Louise Zibold, received her medical degree from the Women’s College of Pennsylvania (now part of the Drexel University College of Medicine) in 1945. During her residency at Philadelphia General Hospital, she met the man who would become her husband, Eric Reiss. The couple moved to St. Louis in 1954 where Eric worked in the medical school at Washington University and Louise as an internist at the City Health Department. Beginning in 1959, the Reiss’ began collaborating with a local group that included Washington University biologist Barry Commoner to found the Greater St. Louis Citizen’s Committee for Nuclear Information. Later in the year, the committee, along with two St. Louis area dental schools, initiated the Baby Tooth Survey. The mission of the Baby Tooth Survey was to demonstrate that nuclear bomb testing was increasing the concentrations of Strontium-90 found in the human body. Strontium-90, one of the components of radioactive fallout, can make its way into the human food chain through cow’s milk. As a result of its chemical similarities to calcium, it is readily incorporated into human bones and teeth, where it remains for the rest of its long half-life, emitting radiation that damages the surrounding tissue and increasing one’s chances of developing cancer. Over the twelve years that the Baby Tooth Survey ran, more than 300,000 teeth were collected from the St. Louis area and analyzed in the project’s laboratories. The results of the project were profound, if not entirely unexpected. Chemical analysis showed that the teeth of children born in 1950 – before most of the bomb testing had taken place – contained about fifty times less Strontium-90 than did the teeth of those born in 1963. The study clearly indicated that the effects of radioactive fallout from nuclear testing were trickling down to humans. CNI newsletter, ca. 1960, which includes an update on the Baby Tooth Survey. 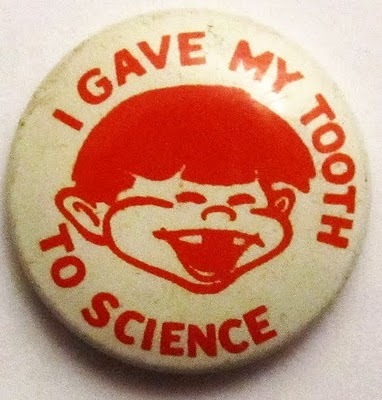 In mid-1963, Eric Reiss presented the to-date results of the Baby Tooth Survey to a Senate committee, and although the data at the time didn’t come across as forcefully as the statistic mentioned above, they still proved to be significantly persuasive. Later in 1963, after years of negotiation, a Partial Test Ban Treaty was signed by the United States, the Soviet Union and Great Britain. This was a major victory for the Reiss’ and the rest of the Committee for Nuclear Information, but they weren’t the only ones who were pleased. 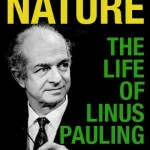 As has been well-documented on this blog, Linus Pauling had taken a strong anti-bomb stance after the two atomic bombs were dropped on Japan in 1945, and had been protesting nuclear weapons testing for several years before the Baby Tooth Survey was conceived. As increasingly powerful bombs – especially the hydrogen bomb – were developed in greater quantities, Pauling’s concern grew accordingly. In 1955 he signed the Russell-Einstein Manifesto, which spoke out against the dangers of nuclear war; one of many anti-nuclear petitions that Pauling supported during this time. However, Pauling wasn’t content to only protest war; he also wanted to put a complete stop to the testing of nuclear bombs. 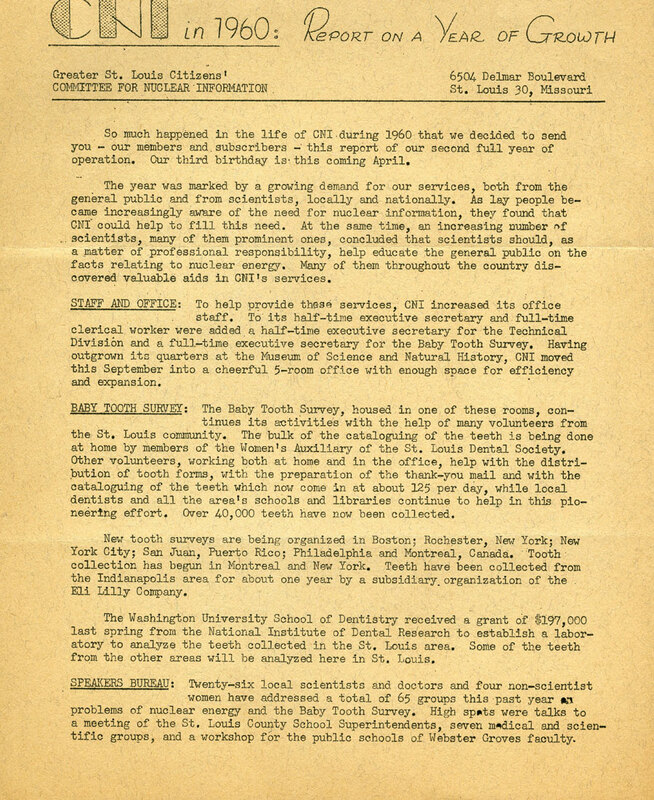 In May 1957, after a period filled with many speeches exposing the possible health issues that bomb testing could create not only in the United States, but all over the world, Pauling, his wife Ava Helen, and two other scientists decided to circulate a scientists’ petition to stop atmospheric nuclear testing. One of those original scientists was Barry Commoner, the same man that would collaborate with the Reiss’ to found the Baby Tooth Survey two years later. Commoner worked closely with Pauling to distribute the petition, and within a few weeks they had already gathered signatures from about two thousand scientists. By the end of 1957, that number had grown to over nine-thousand signatures. 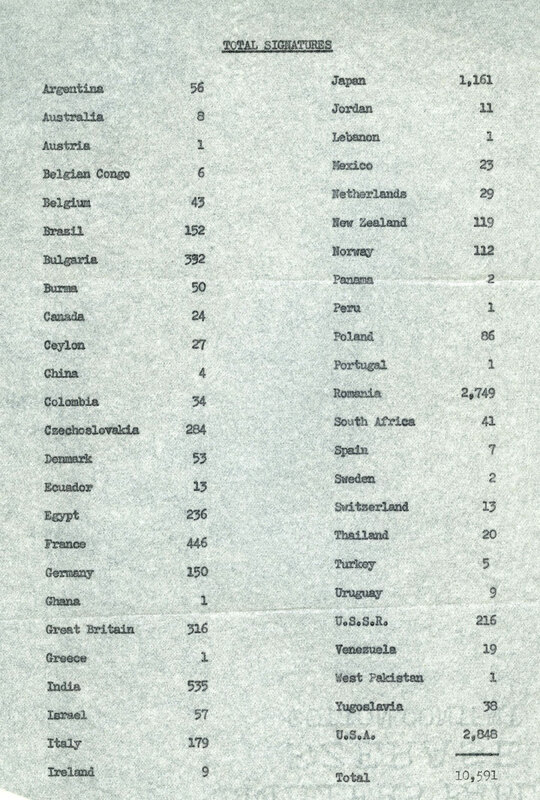 Tally of petition signatures by country, 1958. Although Pauling’s petition didn’t lead directly to a nuclear test ban, it was – along with the CNI’s Baby Tooth Survey – undoubtedly instrumental in getting the Partial Test Ban Treaty signed. After the signing of the treaty in 1963, the Baby Tooth Survey continued to run, eventually ending in 1970. Final analysis of the data gathered by the survey indicated that Strontium-90 levels in the teeth of children born in 1968 were fifty-percent lower than were the levels in the teeth of those born in the immediate wake of the treaty’s signing five years earlier. Pauling liked to state in his anti-testing speeches that “the only safe amount of Strontium-90 in the bones of our children is 0,” and although the treaty couldn’t achieve this, it was undoubtedly a step in the right direction.